Our Hydraulic Equipment are offered in a wide range which is comprised of Hydraulic Cylinders, Hydraulic Jack, Hydraulic Power Pack and Hydraulic Presses. Our Hydraulic Equipment are fabricated with the use of best quality components that impart strength and durability. The Hydraulic Equipment that we offer are heavy duty and well-tested under strict industry norms for enhanced performance. Moreover, we provide these Hydraulic Equipment at affordable prices. 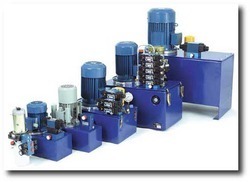 We are specialized in manufacturing, exporting and supplying the exceptional Hydraulic Power Pack. We provide Hydraulic Power Pack in manifold block design to reduce piping. We also offer custom built Hydraulic Power Pack to our honored clients according to their specific requirements to be used for various applications. We are offering Hydraulic Power Pack Machine which is a special purpose machines used for machine tool applications.